1. Go to Clinica Del Rio above the 24 hour chemist in main street of San Pedro with your old licence. 2. List any prescription tablets that you are on and any operations that you have had, this information is required on the form they will give you to fill in. 3. Following the usual eye test they will give some reaction tests on the computer (not difficult) and then take your photo (3 are required). 4. You keep your old licence and they give you a temporary one that lasts 3 months until the licence proper arrives in the post after 2 months or so. If you are over 70, the price for everything is just 40 euros. Saves going to Malaga police station. You may have to make an appointment but I was lucky and was out completed within 30 mins. The cost is 150 euros." 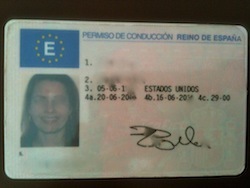 SO HOW DO YOU CHANGE YOUR UK LICENCE TO A SPANISH ONE AND WHAT DOCUMENTATION IS NEEDED ?